Mac OS 10.11 or greater. FTPortal is a door to a specific folder on an FTP server. FTPortal expedites uploading files to specific directories of an FTP server by creating and configuring multiple copies of the app. 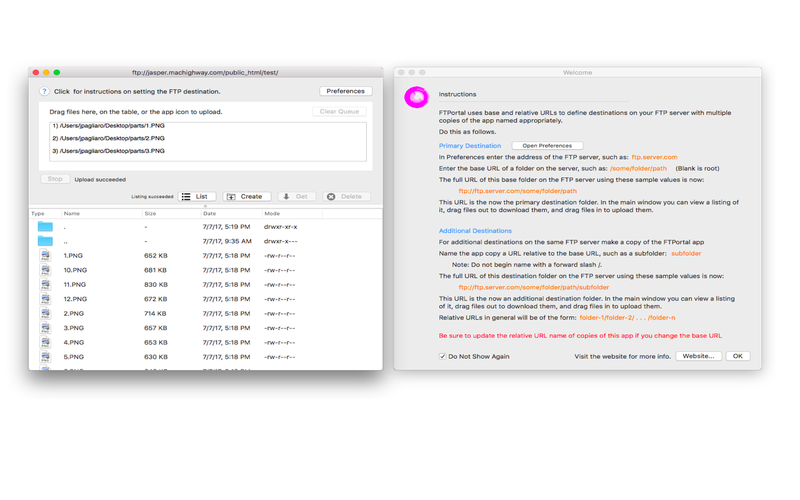 Then you upload files by dropping them onto the main window or application icon in the Finder or Dock. Click the "Preferences" button in the main window to specify the FTP server address (IP address, network name or domain name) and the username and password for the FTP account to be associated with FTPortal. FTPortal supports multiple FTP directories, one for each separate copy of the app. The directory FTPortal uploads files into is determined by the "Base URL" text field in the Preferences window and the name of the app. When the app name is FTPortal then the directory is determined by the entry in the ""Base URL" text field of the Preferences window. If this entry is empty, the "root" folder is used. If the app name is not "FTPortal" then it is assumed the app name is the relative URL of the folder - relative to the base URL in Preferences. 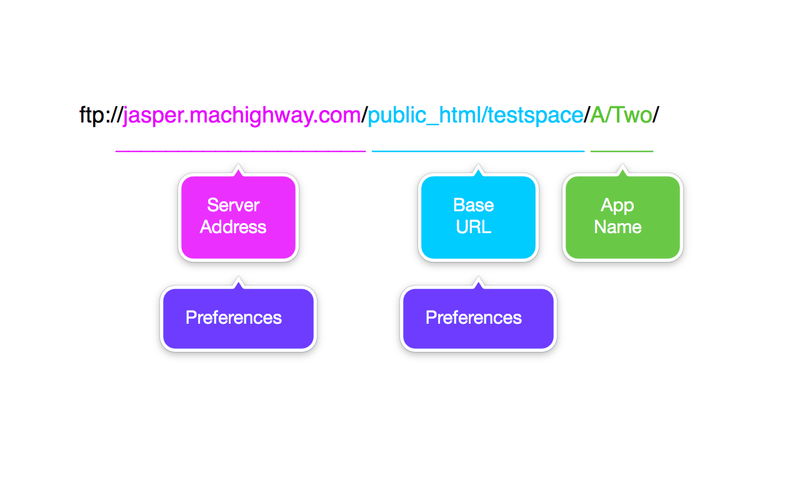 For example, an FTPortal application named "A/Two" with base URL "/public_html/testspace" will upload files into the folder at path "/public_html/testspace/A/Two"
The main window will automatically update its listing table with the contents of the directory it is associated with. When you change the base URL you will need to rename the copies of FTPortal to which you already renamed with relative URLs. An alert will be presented reminding you when you change the base URL in preferences. Simply drag files out of the listing table to the location you want to save the download. Copyright 2017 Limit Point LLC.